This model runs in both PCEnv and COR. It does not recreate the published results, because the published paper had an incorrect equation for I_Ca, which is corrected in this model after consultation with the model authors. In this model, I_Ca has the term (V_m - E_Ca) included to correct the model. Abstract: Riluzole is known to be of therapeutic use in the management of amyotrophic lateral sclerosis. In this study, we investigated the effects of riluzole on ion currents in cultured differentiated human skeletal muscle cells (dHSkMCs). Western blotting revealed the protein expression of greek small letter alpha-subunits for both large-conductance Ca2+-activated K+ (BKCa) channel and Na+ channel (Nav1.5) in these cells. Riluzole could reduce the frequency of spontaneous beating in dHSkMCs. In whole-cell configuration, riluzole suppressed voltage-gated Na+ current (INa) in a concentration-dependent manner with an IC50 value of 2.3 uM. Riluzole (10 uM) also effectively increased Ca2+-activated K+ current (IK(Ca)) which could be reversed by iberiotoxin (200 nM) and paxilline (1 uM), but not by apamin (200 nM). In inside-out patches, when applied to the inside of the cell membrane, riluzole (10 uM) increased BKCa-channel activity with a decrease in mean closed time. Simulation studies also unraveled that both decreased conductance of INa and increased conductance of IK(Ca) utilized to mimic riluzole actions in skeletal muscle cells could combine to decrease the amplitude of action potentials and increase the repolarization of action potentials. Taken together, inhibition of INa and stimulation of BKCa-channel activity caused by this drug are partly, if not entirely, responsible for its muscle relaxant actions in clinical setting. Schematic diagram of Wang et al. 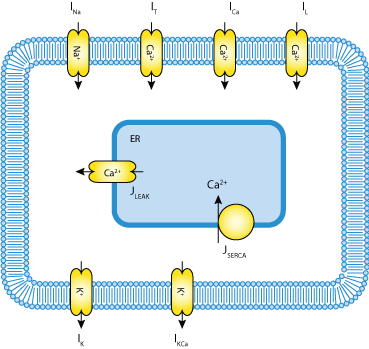 cell model. Derived from workspace Wang, Lin, Lin, Wu, 2008 at changeset 8daae4dd06e9.